For other uses, see Ariège (disambiguation). Ariège (French pronunciation: ​[aʁjɛʒ]; Occitan: Arièja [aɾiˈɛdʒɔ]) is a department in Southwestern France, in the Occitanie region. It is named after the Ariège River and its capital is Foix. Ariège is known for its rural landscape, with a population of 153,067 as of 2016. Its INSEE and postal code is 09, hence the department's informal name of le neuf. 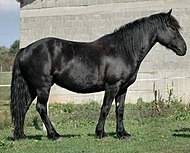 The inhabitants of the department are known as Ariègeois or Ariègeoises. 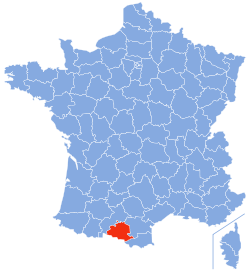 The department is part of the current region of Occitanie and is surrounded by the French departments of Haute-Garonne to the west and north, Aude to the east, and Pyrénées-Orientales in the south-east, as well as Spain (Lleida) and Andorra in the south. Covering an area of 4,890 km2, the department is divided into three arrondissements: Foix, Pamiers, and Saint-Girons. It is composed of 13 cantons, 21 intercommunalities, and 331 communes. In 2009 the Regional Natural Park of the Ariège Pyrenees was created covering about 40% of the area of the department of Ariège. The north of the department consists of plains, hills and low valleys where agriculture is prevalent. Part of Lauragais covers the northeast of the department. Two major rivers, the Ariège and the Lèze traverse the plain from south to north. A landscape of grain fields dominates the scene with growing of corn and sunflowers and with prairies. This area includes the Plantaurel mountains and the Pre-Pyrenean hills below 1000 m. Various geological structures are present in contrast: the Foix Valley with its granite mountain landscape and the Lavelanet region with marl and limestone. The geography is dominated by the Pyrenees mountains exceeding 1,000 m above sea level which form the border between France and Spain. The Pica d'Estats (3143 m), the peak of Montcalm (3077 m), and Pic de Sotllo (3072 m) are the highest points of the department. These peaks are clearly visible from Toulouse in the Haute Garonne. The landscape is dominated by forests with coniferous species coexist with hardwoods such as chestnut trees, Black Locust trees, ash trees, and beech trees. There are hundreds of kilometres of well-marked paths which allow exploration of the magnificent Pyrenees mountains. The high mountains are easily accessible via good roads, cable cars or by foot. There are a number of lodges providing high level mountain accommodation that are comfortable, warm and with good meals. There are also a number of fresh water lakes which provide a variety of activities including, walking, swimming, fishing, canoeing, sailboarding and picnicking. There are several downhill ski resorts, the three largest being Ax-Bonascre, Les Monts D'Olmes and Guzet-Neige. There are many cross country ski-ing resorts, one of the best being at Plateau de Beille, near Les Cabannes. Ariège is one of the least populated and most unspoiled regions of France. The locals enjoy keeping traditions alive, especially old farming techniques. Consequently, as fewer insecticides, for example, have been used, the flora and fauna of the area continue to be rich in both diversity and numbers. Butterflies are common and birds are numerous; particularly noticeable are large birds of prey, including the magnificent Griffon vultures. There are also many unspoiled villages and hamlets tucked away in the valleys close to the department's border with Spain – Seix, Cominac, and Aulus-les-Bains are examples – together with picturesque mountain villages, most notably Aleu which comes alive in the holiday season. There is no great tendency to summer drought, as the flow of air from the north-west brings rain throughout the year. 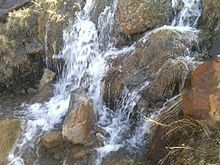 Rainfall is moderate on the foothills and in some sheltered valleys, measuring 700 to 1,000 mm per year, but increases significantly in the higher valleys with levels between 1,000 mm and 1,800 mm. The slopes exposed to the north-west, such as Aulus and Orlu, are, as one would expect, the wettest, together with the frontal ridges that meet air flow from the southwest (giving rise to the Foehn effect). Snow cover is common over 1,000 metres, lasting several months above 1,500 to 2,000 metres. Some periglacial areas exist over 2,500 m but the only true glacier in Ariège is that of Mont Valier, near Castillon-en-Couserans. Temperatures are mild in the foothills, most notably at the city of Foix (400 metres) the average is 5 °C in January and 19 °C in July. However, they decline rapidly with elevation, e.g. at l'Hospitalet-près-l'Andorre (1,430 m) it is 0 °C in January and 14 °C in July. Ariège is one of the original 83 departments created during the French Revolution on 4 March 1790 under the Act of 22 December 1789. It was created from the counties of Foix (Languedoc) and Couserans (Gascogne). A request was made to the Council of State to rename the department Ariège-Pyrénées. According to the proponents of this project, the word "Pyrenees" would better position the department to promote itself throughout France. The demand was rejected. Foix is the administrative capital of the Ariège. It is an ancient medieval town with a fortress, Chateau de Foix, perched on a hill overlooking it. The fortress has been attacked many times without being captured including an attempt by Simon de Montfort. It has also been used as a prison, and the names of English prisoners of war can still be seen on the cell walls. Another famous castle in the Ariège is Montségur, located on a rocky outcrop at a height of 1200 metres. During the Albigensian Crusade and siege in 1244 the castle was largely destroyed, with more than two hundred Cathar priests burnt at the stake as heretics. The castle was gradually rebuilt by Royalists over the next three hundred years. The start of the seventeenth century saw the area ravaged by the Huguenot rebellions of Protestants against Catholics. In 1621 the Huguenot forces ruined the church at La Tour-du-Crieu. In 1629 Pamiers was sacked by Henry of Condé following uprisings that left several hundred dead in the city. This was also the period during which the abbeys at Foix, Tarascon-sur-Ariège, Saint-Girons, Saverdun and Le Mas-d'Azil were torched and destroyed. The nineteenth century was a time of strong industrial growth, supported in Ariège by an abundant supply of water power. The department also benefited from its significant reserves of iron ore. The growth of iron-based industries was a feature of the period with the establishment, in 1817, of a steel manufacturing plant at Pamiers. This has been the principal driver of the local economy ever since. Other representative examples of the iron-based industries that developed in Ariège during the nineteenth century include the forges at Montgaillard and the blast furnaces at Tarascon-sur-Ariège. An additional part of the department's industrial development during the nineteenth century was the paper industry at Saint-Girons and the textile industry in the Pays d'Olmes. Changes in forest laws in 1829 resulted in the War of the Maidens, a revolt by peasants who resisted losing their rights to use the forests. They disguised themselves as women while performing acts of rebellion. Towns of particular historical interest in the department include Pamiers, which hosted a large commercial centre and three churches; Mirepoix, a medieval town; and Saint-Lizier, which is situated on a hilltop with winding streets, fine views, and a church with cloisters that are noteworthy. Saint-Girons is an agricultural centre with a Saturday market. The red and gold represents the County of Foix and the bell is the emblem of Couserans, countries of the former province of Gascogne. This blazon, proposed by Robert Louis, is not official. Or, with 3 pales of gules and escutcheon of azure charged with a bell in argent. The patriotic song Arièjo O moun Pais was written by Father Sabas Maury, born on 1 March 1863 in Gestiès in the valley of Siguer. He was the pastor of Miglos and Varilhes. It became the anthem for Ariège. The Ariège department is a largely unknown department which is situated next to Aude in the southwestern part of the Occitanie region. It shares its borders with Aude, Andorra, Haute-Garonne and Pyrénées-Orientales. It is predominantly a farming area, as the soil is rich and fertile. More than 50% of Ariège is mountainous, with 490,965 hectares being covered by forests. 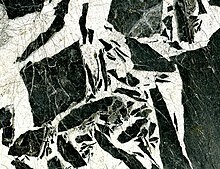 Limestone breccia, polished stone marketed as "French Grand Antique Marble". Old quarry at Aubert, Lez River Valley, southwest of Saint-Girons, western Ariège Department. In the Ax valleys, the mining of talc is the most typical activity. The processing plant for talc at Luzenac is supplied by Carrière de talc de Trimouns, which is the largest producer in the region (400,000 tonnes per year). This industry is supplemented by tourism. Winter sports resorts are located at Ax 3 Domaines, Ascou-Pailhères, Plateau de Beille, Le Chioula, and Goulier Neige. In the Lavelanet area, the textile industry used to be significant, but much of the industry has moved out of the country and offshore. A few companies have tried to persist in the face of competition from lower cost-labor in Eastern Europe and Asia. In the Pamiers area metallurgy, aeronautics, and chemistry are the main industries. Metallurgy, at the Aubert & Duval factory, produces forgings for the aerospace and energy industries. Several companies are in the aeronautics outsourcing industry, such as Recaero and Maz'Air, partners with aircraft manufacturers. Chemistry is represented by the paint industry with the Alliance Maestria, which includes several companies making paint for anything from buildings to aircraft. In the same sector, Etienne Lacroix in the commune of Mazères, mainly manufactures fireworks and pyrotechnics. For the Saint-Girons area, industry is in decline. It is represented mainly by the production of paper. Hydroelectric production from Ariège is about one-fifth of Pyrenean production. The hydroelectric plant at Aston has the largest annual production capacity in the Pyrenees (392 million kWh). With Orlu and L'Hospitalet-près-l'Andorre, these three plants have the largest capacity in the department. The hydroelectric developments in Ariège can support a city of 600,000 inhabitants. Large industrial plants use the energy produced together with the natural gas from Lacq. The Ariège Chamber of Commerce and Industry is situated at Foix. The department's Economic Development Agency (ARIEGE EXPANSION) is at Verniolle. The department has established three 'business incubators' to support enterprise in Ariège. A train arriving in Pamiers station. Mostly mountainous and rural, the department of Ariège is far from the main transport routes serving the main valleys and coastlines. The railway arrived in the department in 1861 with the Toulouse to Puigcerda line which is the only line that remains open to this day in the department. Besides the trains of the TER Midi-Pyrénées, this route is still served by Intercity trains from Paris-Austerlitz. Since 2002 Ariège has been connected to the national motorway network via the A66 autoroute which joins the A61 autoroute at Villefranche-de-Lauragais and continues south of Pamiers by the National Route NR20 as a dual carriageway as far as Tarascon-sur-Ariege. The department has 151,477 inhabitants, or 146,289 without double counting. NB : The communes in italics are part of the agglomeration of Pamiers. The department has 2 Urban Areas: Foix (17,000 inhabitants) and Pamiers (23,876 inhabitants). According to the general census of the population of 8 March 1999, 26.5% of available housing in the department consists of second homes. The following table indicates the main communes of Ariège in which the number of second homes amounts to more than 10% of total dwellings. The department has two parliamentary constituencies and 13 cantons. In general it can be said that: "With a republican and secular tradition since the Third Republic, Ariege is firmly held by the Socialist Party (PS) even though in recent years the right has managed to sink a few corners of the fortress". This resulted in a parliamentary representation until 2017 was dominated by the PS and a General Council where 19 of the 22 members were PS or close to this party – the political orientation of the department is therefore clearly identified. In 2007 it was the department with the most votes for Ségolène Royal (59.56%). In 2012 it had the third most voters for Francois Hollande in France with 64.69% after Corrèze and Seine Saint-Denis. Although male/female parity is well respected by MPs (Mrs. Frédérique Massat and Mr. Alain Fauré), all 22 councillors were men until 2011 when two women were elected. The gastronomy of Ariège is based on the cooking of Pyrenean regional food, such as cheese or charcuterie from the mountain country. Azinat is the local and typical dish of Ariège. The department is also well advanced in the field of organic farming. Several novels by Louis Henry Destel are set in Ariège. The detective story by Pascal Dessaint Les Pis rennais (The Octopus) is set in the Couserans. It has been reprinted in comics. Most of the novels by George-Patrick Gleize published by the Parisian publisher Albin Michel feature Ariege or the Pyrenees such as Le Temps en héritage (Foix country), Un brin d'espérance (A strand of hope) (Olmes country), Rue des Hortensias Rouge (Ax-les-Thermes country), Le Forgeron de la liberté (Mirepoix country), Le Sentier des pastelliers (Mazéres region), La Vie en plus (Couserans), Le Destin de Marthe Rivière (Le Quérigut), Le Chemin de Peyreblanque or L'Auberge des myrtilles (Tarascon country), Une nuit en juin (Cerdagne and Pamiers region). Mirepoix Musique promotes concerts of classical music, talks and readings in and around Mirepoix. MiMa is an international festival of the art of marionettes held every summer in Mirepoix. Each year the event is guided by a central theme. The line-up showcases a variety of techniques including object theatre, glove puppets, string puppets and marionettes portées (puppets carried by a handle on the back of the head). Joseph Bergès (1878–1956), born in Saint-Girons, was a painter. René Gaston-Lagorre (1913–2004) was a painter who had his workshop in Couserans and lived in Seix. Pierre Daboval (1918–2015) was an artist. He lived in Mirepoix from 1998 until his death. Mady de La Giraudière (1922-) is a painter born in Lavelanet. Roger Bataille (1926–62), born in Foix, was a painter. Christian d'Orgeix (1927-), the surrealist painter, was born in Foix. Terence Macartney-Filgate (1924-) is a British-Canadian film director living in Mirepoix. He has directed, written, produced or shot more than 100 films in a career spanning more than 50 years. Marie de Calages (1630–1661), born in Mirepoix, was a poet, crowned many times by l'Académie des Jeux Floraux. Louis-Henry Destel (1885–1962), novelist born in Lézat-sur-Lèze, died at Saint-Girons. Marcel Pagnol (1895–1974), the novelist, playwright and filmmaker, taught at the École Supérieure in Mirepoix. Remy Marrot (author of the novel 'Le Tribunal du peuple') teaches in Pamiers. Jean-François Boyer (1675–1755), Bishop of Mirepoix from 1730–1736, tutor to the Dauphin, Louis XV's son. Raymond Augustin Mailhat (1862 – 1923) born in Saurat, was a manufacturer of telescopes and precision optical instruments. ^ "Le Président du Conseil Départemental" (in French). Conseil Départemental de l'Ariège. Retrieved 23 March 2017. ^ "Département de l'Ariège (09) - Résumé statistique". Publications et statistiques pour la France ou les régions (in French). Institut national de la statistique et des études économiques - INSEE. Retrieved 10 February 2015. ^ Inhabitants of France (in French). ^ Patrice Rieu (January 2001). "Les Demoiselles". Retrieved 13 December 2015. ^ "Ariège Expansion, agence de développement économique en Ariège Pyrénées". Ariège Expansion. ^ Press Files, Rail Plan for Midi-Pyrénées 2007–2013, The Portet-Tarascon line: History and characteristics of the line, April 2011, p 11, consulted on 11 November 2011 (in French). ^ "Tarascon-sur-Ariège. Rencontre avec Marcelle Bernadac". ^ Atkins, James. "James Atkins Design. Print and digital design. UK, US, France, Switzerland, Italy". www.mirepoixmusique.com. ^ "MIMA – Festival des arts de la Marionnette de Mirepoix en Ariège". MIMA – Festival des arts de la Marionnette de Mirepoix en Ariège. ^ "9. L'énigmatique Roger Bataille colore l'austérité de Niaux". ^ "Christian d' Orgeix – Centre Pompidou". ^ "Rémy Marrot : jeune écrivain". Wikimedia Commons has media related to Ariège. 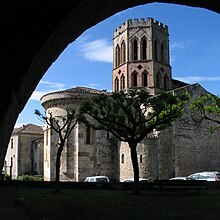 Wikivoyage has a travel guide for Ariège.